Southern Oregon is a beautiful and picturesque area offering Rogue River adventures, wine tastings, the Oregon Caves, Shakespeare Festival and wonderful camping. But did you know, beyond the camp sites, hotels and motels there are unique accommodations where you can literally climb a tree to go to bed? The Out N' About Treehouse's located near Cave Junction, offer more than a step up from traditional camping with their four star Treesort lodging as well as onsite activities such as horseback riding, zip line rides, art classes and full service spa (of course located in a treehouse). Whether you are looking for a family adventure or an adventure to bring out the kid in you, this is a one of a kind vacation where the fun never stops! The 36-acre property boasts 13 treehouses, horse stables, swimming pool with fresh water pumped from the river, giant swings, ropes and a communal fire pit. Out N' About is more than just a location to sleep, in fact you might just feel like you have been transported to a page from Swiss Family Robinson. Besides the impressive treehouses, you'll find ropes, tire swings and the longest rope swing I have ever seen, platforms, seven swinging bridges ranging from eight to 32 feet off the ground and from 12 to 90 feet long. It is almost impossible to gather the kids and resist exploring your inner Tarzan before checking in; but once that is out of the way- it is time to explore! I have never been so excited to see a room. These are truly works of tree art. Decorated in outdoorsy style, rooms offer electricity, windows, bed and bedding, most have platforms or a balcony and all are one of a kind, handmade accommodations. Exploring the network of bridges that connect many of the tallest treehouses is an adventure in itself. The bridges, made out of wood planks and ropes, test any issues with height and balance, but once you have that mastered, traversing high above the ground turns out to be a lot of fun. Daily activities include art projects, such as mosaics, scheduled horseback trail riding, and for the daredevils out there- the zip line course. The zip course startsout harmlessly with a short practice zip to learn how to stop yourself, where to place your hands and how to hook and unhook off the line. But before you know it you'll be soaring through the air 650 feet, then for the real fun, climbing 45 feet up a Douglas Fir for the third zip. I am scared of heights, so I don't know how I actually made it to the top, except for the encouragement of the guides. Then a short hike into the woods for the last zip; right through the trees. Evenings at the resort find many of the treehouse residents around the communal fire pit, preparing dinner in the communal kitchen or at one of the many bbq's, sharing stories of where they are from and how many times they have visited and of course roasting a few marshmallows. You might expect Out 'n' About to lure mostly families, but there were a surprising number of adult vacationers. It seems that big or small a place like this brings out the kid in all of us. 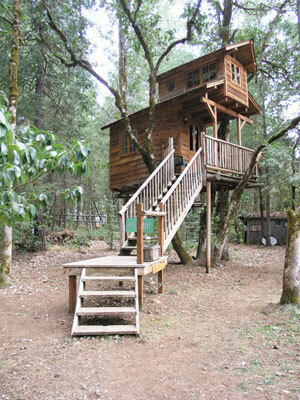 About Out 'n' About Treesort & Treehouse Institute: The treehouses are also open for daily tours and as a stand alone tour is definitely worth a stop. Tour Hours & Fees: $5.00 per adult and $2.50 per child (12 & under) Monday, Wednesday and Friday, 12pm to 2pm on the hour April through October. Getting there: From I-5 north take Grants Pass exit 58 or From I-5 south take Grants Pass exit 55. Take Hwy 199 to Cave Junction. South of Cave Junction, take a left on Rockydale Road. Make a left at Waldo Road. Make a right on Takilma Road. Turn left on Page Creek Road. Take gravel road to the end. Please respect the neighborhood by driving slowly.